It is one of those decidedly un-summerlike summer days in Chicago, with a westward wind off the Lake that hints of changes coming, and a thick blanket of clouds that renders the sky and the water and seemingly everything in between colorless, undifferentiated, vaguely threatening. But today none of that matters here in Jackson Park, a few miles south of the Loop, where the ghosts of 1893’s World’s Columbian Exposition still hover, and where someday the Obama Presidential Library will rise. Because these are the games of the XXXI Summer Olympiad, and this is the start of the field hockey competition in the shiny new 20,000-seat stadium. The park was recently renovated to accommodate this spectacle, this world’s fairy tale – and rising from the lagoons are majestic new structures surrounded by angelic landscaping that still has neat piles of cedar mulch at its base. A thousand flags snap tautly in the breeze. There are boats on the Lake jockeying for dock slips. Vendors are hawking exotic foods. From the numerous bandstands, trombones and baritones blast their brassy voices futilely into the wind. Tens of thousands of people revel in the sights, and a polyglot din can be heard throughout the park. All the world’s a stage, but there is no stage right now as grand as Chicago. Or at least, that’s the way it would have been if John Murray had gotten his way. Murray – Marine Corps veteran, former Delta Airlines mechanic, former management consultant, and lifelong proud son of Chicago’s west side – was the Chief Bid Officer of “Chicago 2016,” an organization of civic leaders, industrialists, politicians and others who from 2006 through 2009 worked feverishly to prepare Chicago’s bid to host the Summer Olympics. The effort involved nearly $50 million dollars, scores of people, sophisticated research and targeting, top-tier celebrities, and exactly the sort of elaborate marketing campaign that is required nowadays for a city to recast its image and position itself as a legitimate contender for the right to host an event like the Olympics, the Super Bowl, or the World Cup. When Chicago officials first made public their intention to bid for the Olympics, in the summer of 2006, the Windy City was certainly one of the favorites to prevail. The last American city to host the Summer Games had been Atlanta in 1996 – Salt Lake City had hosted the Winter Games in 2002 – and Chicago was not only larger and wealthier but was also far more renowned for its long sporting history, from venerable Wrigley Field to the Monsters of the Midway to Michael Jordan and the Chicago Bulls’ six NBA championships. Chicago seemingly even had justice on its side, since the city had long ago won a bid to host the Olympic Games, only to lose them to St. Louis as part of that city’s 1904 World’s Fair (Pierre de Coubertin, founder of the modern Olympics, did not even travel to St. Louis for the 1904 Games: “I had a sort of presentiment that the Olympiad would match the mediocrity of the town,” he said). But to win the 2016 Games, Chicago would need to engage in a multi-part competition – first, gaining the blessing of the United States Olympic Committee (U.S.O.C) over rivals such as Los Angeles, San Francisco, Houston, and Philadelphia, and second, winning over the roughly 100 members of the International Olympic Committee (I.O.C. ), who would ultimately be reviewing the bids of the U.S. winner along with those of Madrid, Rio De Janeiro, Tokyo and others; at least 17 different nations were at one time thought to be preparing bids. Perhaps more importantly, they would need to win the public relations battle against themselves. Chicago had great civic pride, plenty of money, the Lakefront, and some terrific existing facilities such as Soldier Field and the McCormick Place convention center; but it also had an image as a dangerous, logistically difficult, deficit-riddled, politically corrupt city. And while the prospect of bringing the world to the shores of Lake Michigan was enticing to many, there were other large segments of Chicago’s engaged citizenry that were highly skeptical about the costs, the environmental impact, the disruptions, and the benefits of hosting the Summer Games: a Chicago Tribune/WGN poll in the late summer of 2009 found that 47% of Chicagoans supported the plans for the Olympics, and 45% opposed them. Thus, while Chicago’s prospects would be influenced by politics, and money, and its relationship with the U.S.O.C., and even by America’s standing in the world, at its core the campaign would be all about P.R. And so, with an exceptionally clever all-out marketing blitz, Chicago set out to win hearts, minds, and the Games. It began modestly enough in February of 2006, behind closed doors. Chicago Mayor Richard M. Daley was thinking about the 2016 Olympics, and asked a team from the consulting firm of McKinsey & Company (where Murray then worked) to quietly assess the viability of a prospective bid. Murray and two of his colleagues holed up for a month with a handful of other people from the Mayor’s Office, the P.R. firm Hill & Knowlton, and the architectural engineering firm Skidmore Owings & Merrill. In typically clinical and dispassionate consulting-firm fashion, they produced a cost-benefit analysis and a risk analysis about whether Chicago should bid for the Olympics. Murray’s assessment: he believed they would win the U.S. bid, and they could also win the international bid – so long as Rio De Janeiro didn’t emerge as the primary rival. Meanwhile, John Murray remained on McKinsey’s payroll for several more months before joining Chicago 2016, but that was just a formality: his job was now squarely focused on bringing the Olympics to Chicago. So over the next few months, Murray spent 60 hours a week meticulously studying the Olympic landscape as if it were an engine blueprint during his time as a helicopter mechanic with the Marines. He traveled to the I.O.C. headquarters in Lausanne, Switzerland to spend a week reading through past Olympic bids. He went to Los Angeles to study the archives of the 1984 Summer Games, and to London to speak with people who had been involved in that city’s successful bid for the 2012 Summer Games. Little by little, he started to hone-in on the strategy that Chicago would use for its bid – and that was first and foremost about marketing. Perhaps that is a lingering effect of its status as the “second city,” an also-ran in the great parade of municipalities. After all, when Chicago was founded in 1833, New York already had more than 200,000 residents; and even before Mrs. O’Leary’s cow supposedly kicked over the lantern that started the great fire of 1871 – destroying 17,500 buildings, wiping out Chicago’s central business district, and leaving one-third of the population homeless – even Philadelphia, Brooklyn and St. Louis were larger and arguably more important cities. Henceforth, the Chicago 2016 campaign would be about more than winning the rights to host a sporting event; it would be about positioning and reputation management. “It was all based on branding the city and marketing Chicago as a destination. How do you win the war for talent, for investment, for business and for tourism?” It would have to start with changing the way people thought about the city. We realized the single biggest selling point from an Olympic perspective was that the Olympic Games are an opportunity to get your city in front of 4 billion viewers in a positive light. We knew that the opening ceremonies, the opening shot of each night’s TV coverage of the Games, globally, would be that Lakefront view that apparently a lot of the world doesn’t realize exists. Forget about a Lake, this is a sea by European standards. I used to love meeting international visitors and bringing them to the bid office on the 20th floor of the Aon Tower, and having them look out at the Lakefront – you know, you can’t see the other side of the Lake – and they are just blown away. ‘Oh My God, this is a coastal city. It’s so clean, and people are so friendly!’ All these things that are so counter to what people’s perceptions are…. There was joy in the offices of Chicago 2016, for all of about half an hour. And then the marketing campaign really began. Ryan and Murray knew that not a single person in Chicago would have a vote in determining whether the city was awarded the Summer Games, but from a public relations perspective it would be unseemly if the applicant city didn’t present a more-or-less united front. Accordingly, the Chicago 2016 team methodically built its case for why the city would be a great partner for the I.O.C., compiling facts and statistics that were sure to be persuasive to dubious members of that multinational body. Chicago, they said, had an excellent transportation infrastructure: O’Hare was one of the busiest airports in the world and the only one with two hubs, plus daily nonstop service to 70 cities around the globe. Chicago was also a cosmopolitan center, they noted, with 150 languages, 83 consulates, 23 sister cities, 25 communities of 25,000 or more ethnic residents, and the largest Polish population outside of Warsaw. And financing, they argued, would not be a problem for Chicago, even though, unlike other international bidders, U.S. cities do not get full governmental guarantees of funding. The city of Chicago itself had guaranteed the bid up to $500 million if private money fell short, and the state of Illinois another $250 million; but Pat Ryan had also cleverly managed to obtain insurance policies for another $500 million to cover any cost overruns, revenue shortfalls, or natural disasters. On June 4, 2008, the I.O.C. Executive Committee narrowed down the field of applicants to four: Chicago, Rio de Janeiro, Madrid and Tokyo. Chicago 2016 then began to refine its campaign, even though by I.O.C. rules they were not allowed to disparage any other applicant city. Instead, they set out to beat the competition using the one discipline with which Americans distance themselves from all other peoples: marketing. But Chicago’s marketing was particularly savvy, highlighting every strength and countering every perceived weakness, backing it up with unassailable research, and presenting it all with glitz and glamour. And their efforts to woo the I.O.C. members did not stop there. Chicago 2016 also conducted focus groups with participants who were carefully selected as proxies for each of the I.O.C. voters. This was not unlike the tactic used by clever lawyers prior to jury selection, or by Congressional whips prior to an important piece of legislation; when every vote counts, you don’t want to leave anything to chance. Focus group participants were chosen because they mirrored the demographic, socioeconomic, and work backgrounds of the actual I.O.C. members. Some were wealthy, some were middle class. There were academicians and business people, career athletes and people who had come to sport later in life. “We tried to do a segmentation strategy to figure out how we could get each of those people to vote,” said Murray. Additionally, though unable by Olympic rules to contact the I.O.C. members directly or invite them to Chicago, Chicago 2016 nevertheless found ways to reach them. They ran banner ads and placed stories on GamesBids.com and AroundTheRings.com, two websites that serve as information clearinghouses and are thought to be read by I.O.C. members. In October of 2007, when Moscow was dropped as host of the World Boxing Championships, Chicago scrambled to step in – because they knew that key I.O.C. members like Wu Ching-Kuo of China would be in attendance. On another occasion, after determining that almost all of the I.O.C. members would be together at a conference in South America, Chicago 2016 made arrangements to wrap the newspaper being distributed by the host hotel with an advertorial about Chicago. “When they woke up on the morning of the conference it was Chicago front and center,” said Murray. There was even some surreptitious merchandising. Chicago 2016 created reusable bags made from recycled materials, imprinted with the bid logo and beauty shots of the city. These were distributed all around the international events in the hopes that the families of the I.O.C. Commissioners would pick them up and take them home. The Chicago 2016 bid was officially submitted to the I.O.C. on February 12, 2009. Seven weeks later, the 13 members of the I.O.C. Evaluation Commission came to Chicago for four days of meetings and inspections, and Chicago shifted its P.R. campaign into high gear. They cleaned up trash from the streets, turned on the magnificent Buckingham Fountain in Grant Park earlier than usual, and distributed 10,000 t-shirts to downtown residents. At the swanky Fairmont Hotel, Mayor Daley and the Chicago 2016 host committee – all dressed in matching green ties to emphasize the bid’s environmentally friendly components – welcomed the I.O.C. to the Windy City. Later, the Commissioners were driven around town in a hybrid bus – and in an age-old promotional tactic driven by a modern marketing methodology, Chicago 2016 brought out the masses to line the bus route by sending out 30,000 e-mails and text messages urging people to show up and wave signs of support. During their stay, the I.O.C. Commissioners were also treated to a dinner with Oprah Winfrey and blues legends Buddy Guy and Koko Taylor at the Art Institute of Chicago, featuring locally grown food prepared by Chef Tony Mantuano of Spiaggia, the city’s only four-star Italian restaurant; and they were shown a four-minute videotaped message from President Obama in which he proudly stated: “Chicago is that most American of American cities. Once you discover the Chicago I know, the city I made my home, the city where my wife grew up, the city where we raised our daughters just blocks from where these Games will be held, I’m confident you’ll discover that you’re already in the perfect host city.” Daley also held a reception on the 94th floor of the Hancock Building for 200 members of the foreign press corps who were in town to cover the I.O.C. visit. In short, after being confined to stealth marketing and indirect communications tactics, Chicago 2016 made the most of its key face-to-face meeting. By the middle of 2009 the campaign to bring the Olympics to Lake Michigan had already spanned 3½ years and had cost about $50 million. It had involved an astonishing array of consultants, architects, urban planners, financiers, insurance executives, volunteers, athletes, and politicians, and had employed some of the world’s most sophisticated and clever marketing strategies. But it wasn’t over yet. In October, when it came time for the final presentation to the International Olympic Committee Congress in Denmark, Chicago 2016 added some last-minute glitz and celebrity firepower to the marketing campaign. They brought in Oprah Winfrey again. They chartered a 747 plane with the Chicago 2016 logo on the side, and flew hundreds of supporters to Copenhagen. And they also persuaded the President and First Lady of the United States to fly a different 747 with a different logo on the side and come wield their influence. (For their final presentations Madrid trotted out Queen Sofia and former I.O.C. President Juan Antonio Samaranch; Rio had Brazilian President Luiz Inacio Lula da Silva and soccer legend Pele; and Tokyo had new Prime Minster Yukio Hatayama.) It was certainly an emphatic ending to what had been an impressive campaign, one that cost the four finalists a total of $179.4 million. Certainly, if the battle had been decided by imagery, P.R. dexterity, showmanship, and promotional skill alone, it would have been a walkover. But it wasn’t. In the end, Chicago fell short – shockingly, earning the votes of just 18 out of the 94 participating I.O.C. members in the first round (dead last), and losing out to a city, Rio de Janeiro, that astutely marketed its appealing fun-in-the-sun, rise-of-the-third-world image to overcome many technical and logistical concerns about its own suitability. The “Olympic Watch” viewing parties in Chicago’s Daly Plaza and Washington Park shut down quickly, while the day-long sambas on Copacabana Beach in Rio perhaps ticked up a decibel or two. Within days, John Murray and his team were back in the Aon Tower, wrapping up the books and closing down the corporation. Just what went wrong was never clear. The Olympic Games bidding process is about as transparent as the Olympic ice skating judging process. There are untold layers of politics, side deals, bloc voting, national and continental preferences, implicit strategies about future years’ bids, and all sorts of other intrigue. Pat Ryan blamed it on a “miscalculation” about the voting strategies. I.O.C. members voted for their own regions out of loyalty on the first ballot, he told the Executives’ Club of Chicago a few days later, “and I think people said ‘Chicago is strong enough to get in the second round, my vote won’t matter.’” He also felt that some members who had pledged support while the Obamas were in Copenhagen backtracked once they had left; and that there might have been some backlash from the strained relations between the U.S.O.C. and the I.O.C. For his part, John Murray harkened back to his original assessment from 2006: Rio was the wild card. Since South America had never hosted the Olympics, and since Brazil had become one of the world’s fastest growing economic powers, and since Rio had already won the rights to host the 2014 World Cup, it was possible that no other city could stand in its way, regardless of how effective the marketing campaign. Nevertheless, he called the loss the biggest disappointment of his career. 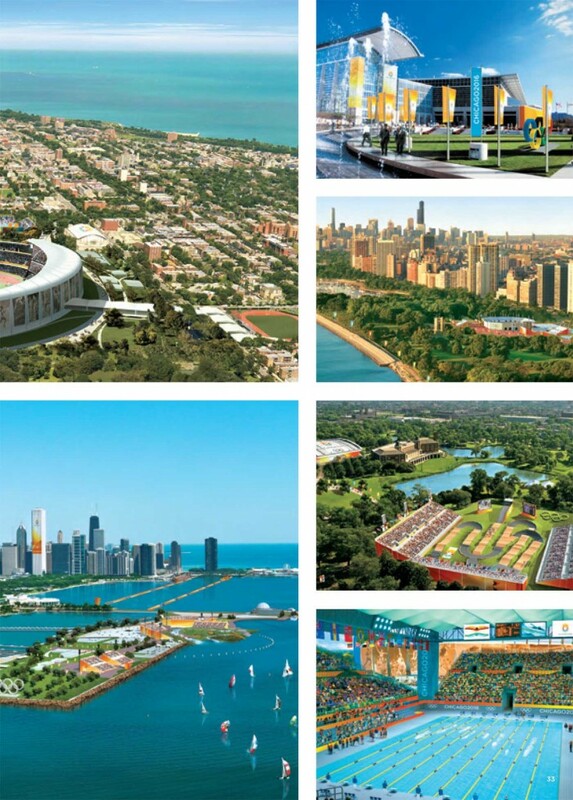 Whatever the combination of reasons, Chicago had lost the battle for the Olympics. But in so doing, they had reinforced and perhaps redefined the central role that marketing plays in influencing people, events and outcomes in our society. Theirs was a high-powered if somewhat disparate promotional campaign, incorporating nearly every tool in the marketing playbook – market research and reputation management, community outreach and media relations, bus ads and Internet videos, shiny collateral and advertorial wraps, op eds and athletes’ endorsements, manufactured crowd support and celebrity appearances. But it began to pave the way for more refined marketing campaigns that would soon bring events like the Big Ten Basketball Tournament, the NCAA Hockey Championship, the America’s Cup Race Series, and the ITU World Triathlon Grand Final (an Olympic qualifying event) to Chicago. John Murray co-founded the Chicago Sports Commission in 2011, and went on to create Arena Partners, a consulting firm that develops marketing and sponsorship strategies for companies and municipalities that want to be involved with large-scale events. Nevertheless, as the real Games now begin in Rio, there will be a lot of people tuning in around Chicago and dreaming about what might have been. Joe Dobrow is the author of Natural Prophets (Rodale Books, 2014) and the forthcoming book Pioneers of Promotion, about the early visionaries of the marketing industry.